The Model 415C Metal Hardness Tester is designed for use in machine shops, laboratories and by inspection and quality control personnel, heat treaters, tool and die makers, mechanics,welders metallurgists, etc. This unique instrument is the easiest and most economical way of grading and checking various metals in the equivalent Rockwell C Scale range of 20 to 67HRC. The impression made by the indenter in the metal being tested is very small and is equivalent to a superficial examination in size. The travel of the indenter, caused by the resistance of the metal sample surface, results in the dial readout in equivalent Rockwell C Scale. Minimum sample thickness is 0.025 for most materials. If the indenter does not make a dimple on the opposite side, the material is thick enough for accurate testing. The instrument comes complete with two Test Blocks (316.29H & 316.29L), Hardness Conversion Chart, and Carrying Case. Weight (instrument only) 12 oz. (340 g ) with case & block) 2 lb. 6 oz. (. 9 kg). Without removing the blue cap, insert the shank of the Model 415C securely into a 1/2 inch chuck in your mill, drill press, or lathe. A sturdy setup is essential for proper operation and long diamond life. The surface of the piece to be tested must be smooth, clean, and perpendicular to the long axis of the instrument. Allow sufficient clearance between the hardness tester and the drill press platform for the test block or sample being tested. Do not let the diamond indenter drag on the test block or test piece as the diamond will break. The tester is shipped ready to use, however, a calibration check may be performed as needed. Insert a clean, smooth portion of the test block (supplied with the hardness tester) directly beneath the diamond tipped indenter in the base of the hardness tester. All measurements must be made at least 3 diameters apart to avoid breaking the diamond indenter. Remove the blue cap and carefully lower the quill or handle until the indenter contacts the test block surface. Then slowly increase the force until the base of the hardness tester makes full contact with the test block surface. While exerting sufficient force to hold the base of the hardness tester in full contact with the test block, and the gauge pointer steady, check to see that the tester reads the test block hardness. The block must be held in position firmly, any movement while a load is on the indenter will break the diamond tip. Raise the hardness tester and move the test block to an unused portion of the block. 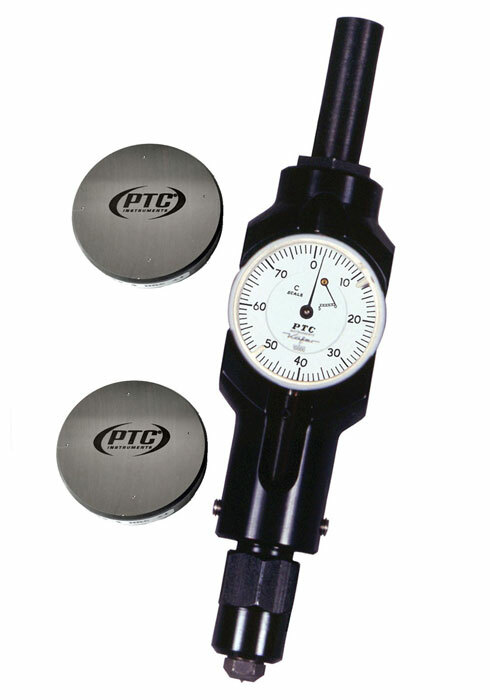 Run the test at least three times and adjust the rim of the gauge to set the dial at the average of the readings. This is very important, as minor hardness fluctuations may occur in even something as precise as a test block. Once this has been adjusted, the hardness tester is good for many consecutive readings before checking it against the test block again. The Model 415C Hardness Tester is now calibrated at a known hardness value and again ready for use. Remove the test block and substitute the metal part to be tested. Remember, it is critical that the sample is held firmly and not allowed to shift or move during the test as the resulting motion will break the diamond. Carefully lower the drill press feed handle or quill until the diamond tipped indenter rests on the sample s surface, then slowly increase the force until the base of the hardness tester fully contacts the metal s surface. Read the equivalent Rockwell C Scale hardness directly on the dial. Make several readings and average the results. PTC® can certify steel hardness blocks using NIST traceable standards for a nominal cost. Test results include five tests and the average value of the block.